Poll: Is 3G a Must for Tablets or Will Wi-Fi Do? The tablet revolution may be upon us as 180 million of the devices are expected to be sold by 2014, but many consumers are still unwilling to take part for a number reasons. People have to decide if and how a tablet device fits into their lifestyle or figure out if it can replace another device instead of becoming yet another screen to see. Both are valid questions, but a third decision point looms large for tablet purchases: Can the monthly budget afford yet another charge for mobile broadband data? Apple’s iPad (s aapl) is offered in a Wi-Fi version, but so far, few other tablet manufacturers have followed suit — potentially a huge oversight that could strengthen Apple’s already tight hold on this nascent market. 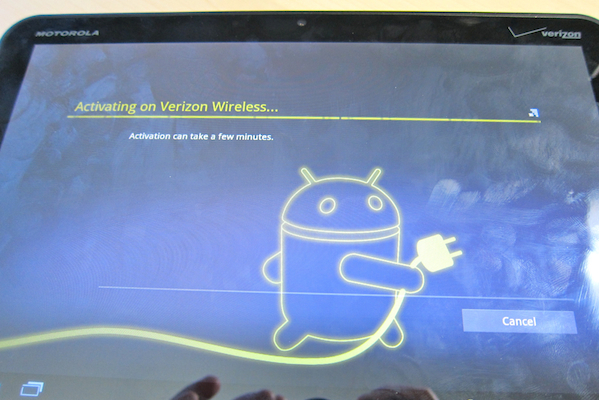 Take the Motorola Xoom (s mmi), for example, which just launched last week. Although my initial impressions and hands-on video show some corners cut to get the tablet to market quickly, there’s much to like about the device, and Google’s (s goog) new Honeycomb platform for tablets. But many potential buyers are put off by the $799 price tag. Yes, the device can be had for $599, but in return for the discount, customers must agree to a 2-year data plan commitment, which starts at $20 per month and can rise to $80 for 10 GB of data usage in a month. Motorola has confirmed a future Wi-Fi version of the Xoom, which is expected to cost around $600. Of course, without a mobile broadband radio in such a model, there would be no monthly bill from a carrier. The 3G vs Wi-Fi debate likely centers on where and how individuals plan to use their tablet. For couch-surfing sessions and other use around the home, a Wi-Fi device will clearly fit the bill. Folks that plan on taking their tablet everywhere — much as they may do with a smartphone, for example — could lean toward a device with full-time connectivity. Of course, the smartphone is becoming the new hotspot as more handsets are gaining the ability to be used for connection sharing, something I often do with my Android handset. Indeed, over on our Apple channel, Darrell suggests that the iPhone’s new personal hotspot feature could make the 3G iPad irrelevant for some. This service is a feature, so it doesn’t require any additional contract commitment and can be used with multiple devices. I actually opted to purchase my Samsung Galaxy Tab with 3G on contract to get the reduced price of $299. Even if I chose to cancel the contract, the $200 early termination fee still keeps my total cost under the unsubsidized. Another reason for the purchase is the tablet’s ability to act as a 3G hotspot at no extra charge. Between my phone and my tablet then, I have two mobile broadband connections for an iPod touch, notebook computer or any other Wi-Fi enabled device. But my preferences are different from most, and lets face it: the Galaxy Tab at that price is far less than the Motorola Xoom at $599 on a contract or $799 off-contract. With a slew of new 3G tablets due to arrive soon are you planning to buy, or will you wait for a less expensive Wi-Fi version to use at home or with a mobile broadband hotspot device? Seriously? Are technology geeks THAT limited in their thinking. The tablet market is a HUGE market for Seniors. (not High School Seniors…elderly) These wise people know there is no need to 1. have a wifi at home with the cost of hardware and and Internet Service Provider, and 2. learn the computer technology just so you can use a tablet. The dumbest thing any of the tablet brainiacs think is that there has to be a wifi connection in a home. No. People use the tablet because it IS NOT A PC. The reason the people of this huge market have a tablet is because for the first time, it is a computer device that they can work as a true consumer device. So a tablet MUST have 3G FIRST and then have an OPTION for Wifi feature. It’s time for the kids who make the design decisions to GROW UP and consider others in the use of these products. But alas, it was idiot parents who raised these self-centered kids. I came back to read this again as I am trying to figure out what I want to buy. I am leaning toward the iPad2 – 32gb but wifi only for the lower cost and the fact I can use my Sprint EVO as a Hotspot as needed (turn on/off as needed and pro-rated even for partial months). I would be ready to pay more for the 3G. On the other hand, there have been many announcements on some cheap, yet interesting looking tablets on the market, that are WiFi only. Forking out double amount to get 3G and little else doesn’t seem logical when I do have an Android phone with tethering. Would be nice to have a mobile hotspot that can work for 10 hours straight, though. Wifi is all good. If you buy the tablet out right and buy a portable router it is cheaper monthly and you can use it to hook up 5 different devices other than your G tab. So wifi is the way to go! In Australia, we are generally bereft of easily accessible and free Wi-Fi when out and about. 3G is a necessity. I think for a majority of people wi-fi only would be just fine. I barely use the 3g connection that comes with my cr-48, but it is handy to have. The hospital I work at and the college I go to have complete wi-fi coverage, even the two local malls have wi-fi coverage. My answer is that it depends on a form factor. Not a fan of 10 inch tablets but I would not need 3G in those. I’d carry my phone which has hotspot, besides it would predominantly be used at home. A 7 inch is a more mobile device. Also, I might replace my phone with a headset so 3G/4G is a must. Completely agree. At CES, I had an iPad and Galaxy Tab with me and the iPad didn’t get turned on once while I used the Tab multiple times per hour because it could fit in my jacket pocket. Was super glad it had 3G connectivity. I have a wifi-only iPad, and it works well for me even though I take it with me everywhere. There are occasions where I wish for a connection but don’t have wifi, and generally I pull out my iPhone and this suffices. Ideally? If (when?) I could use my AT&T iPhone as a hotspot, then I could unequivocally say wifi is all you’d ever need on an iPad (other any other tablet). build in the radio but sell direct instead through the carriers and let the customer decide if they want to drop in a SIM card. this should bring competition for the SIMs including pay as you go options. consumer will like this a gravitate toward the tablets that are unlocked. it might even be feasible to sometimes take the SIM out of a cell phone that already has a data plan and swap it into the tablet, for example when at home and using a landline for phone calls. I find my self myself usually at home or at work ( school ) when I need the internet. The odd times that I do, when I’m not at either locations, my cell is good enough for a hotspot. For the battery life issue on my phone, I’m not so concerned. I could just plug it in and get either a car charger or a second wall charger for work/school and charge it then. I am with the wifi is good enough crowd. I have the wifi iPad and I have never been in a situation where I needed 3g/4g. That is just my personal experience. If I did need 3g though, I could just tether it to my phone. I really despise the idea of paying for multiple 3g/4g data plans. I’m planning on getting rid of my Mifi (on verizon) and using the Xoom when it’s got 4G as my hotspot to share the connection when I need it on another device i.e. my laptop. For tablets, Wi-Fi is enough most of the time. However, it is useful to have 3G capability. What is not necessary signing a contract for data. AT&T and iPad got it right with essentially pay as you go data. You may want to activate $15 worth of data for your trip so you can use your iPad in airports or trains or on the beach. It then expires and you can go months without using 3G at all. For the most part, the tablet is used at home or in an atmosphere like a coffee shop (or data can be downloaded at home before you bring it out to the real world). Here’s the main problem with cell data on a tablet – it is most useful for those that use tablets all the time on the go. However, this is exactly the purpose a smartphone is used for. It makes no sense to pay for data for both of them. If carriers want to offer a “use as you wish” 3G plan that works across tablets, mi-fis, smartphones, laptops, etc, then 3G in non-smartphone devices will be used more. However, it’s safe to assume it never will happen. AT&T offers a no-contract daily, weekly and monthly pre-paid mobile broadband options. It works across any device but it doesn’t do voice or messaging. Their iPad plan is significantly cheaper than the non-iPad data plan and that is the real crime. They should be device-agnostic and pay for the data you use…just like they are with voice. One more benefit with embedded 3G is the security of the connection. None of the insecurities of a Wifi-only connection which can be spoofed or hacked. I don’t always trust “free internet” using the 3G only connection is even more secure than a secured mobile hotspot. So long as I can tether it to an iPhone, why does it matter? But, these artificial limitations are bizarre. I would love to know the breakdown on sales by configuration. I had read at some point last year that around 2/3rds of the iPads sold by Apple were Wi-Fi only models. I’ll see if I can find a recent update though. It matters because, at least here in the U.S., the 3G models are often more expensive to begin with and the only way to get the price down is to commit to a 2-year data plan. Consumers already have those for their smartphones and other devices – do they want another? I think most do not. A cellular radio with 3G is a definite bonus that should be available unlocked. Some tablets don’t have the option for GPS without the cellular radio. I like what Huwaei did with their tablet, throw in the phone (voice and SMS) as a bonus. That way you can do sim-swap and with a bluetooth headset you can do everything you can do on a smartphone and more. With a reasonable prepaid option like the iPad has, people can get 3G when they want it and not be locked into a long term contract that they might not need. The cellular modem is not as expensive as they increase in price they charge and if they offer something similar to GOBI that they have for laptops the customer can choose any provider of 3G and change at a whim and not have to buy a new device. I’m sure that’s how Apple will be going and then everyone else will realize it’s benefits…but tablet manufactures try to sell to the networks and not to the customers so their products reflect value accordingly. I’m with the “WiFi is good enough” crowd. I’m around WiFi almost all the time. I also do think 4G would be great when it is ubiquitous and rates are similar to cable ISP, but until then I’m on WiFi. Wi-fi only is good enough … as long as the GPS works without a data connection. While 3G/4G is not a necessary addition to my Tablet of choice (HP/Palm Touchpad) I would love to have a Tablet that was 4G (LTE) capable. Please don’t hamstring your fantastic devices by tying them to one carrier. Don’t Appleize me to AT&T, and don’t Motorolaize me to Verizon. Pass the savings from a lack of cellular radio, development, and integration on to me. I see a tablet as my next general purpose computer (browsing and office tasks), not my next phone. I think it depends on your usage. I use my iPad at home and work mostly, where I have great WiFi. When I have traveled I seldom am without WiFi nearby, and have my Droid for when that happens. I also agree with ahow628 that price of entry is an issue with 3G models. No way would I pay $130 more for a iPad 3G … and heck noes to a contract data plan! If the iPad 3G had only cost ~$25 – 50 more and had month-to-month plans, I would have gotten it and been happy the 1-2 times I would have used it. It looks like wifi hotspots will soon be a standard option on most smart phones, rendering 3G on tablets redundant. Agreed that it’s becoming a standard option, but there’s a key element that could keep 3G radio options in tablets: battery life. Your phone battery runs down faster when it’s sharing the mobile broadband connection. I work around that with a second battery for my handset because I can’t be left without a phone. However, some handsets (such as the iPhone) have non-replaceable sealed batteries so this isn’t an option. Last I checked running WiFi hot spots drains batteries profoundly. If you running 4G by the time you actually jump on your battery would be toast. Regardless having a tablet with instant on was the point. If you have to mess around with setting up a hotspot you might as well have a laptop instead. I have my Evo which functions as a wifi hotspot so I don’t care about 3G. If they want to toss the option in for free and offer reasonable no contract plans, then so be it. I refuse to pay extra for it though. I also have an EVO. Did you root so it tethers free….or are you paying Sprint 30-bucks a month?